I would be remiss if I didn’t thank Sylvio Bourque for making the initial contact with the Hampton River Runners over a year ago. Shelley Doucet took a major role in making all the connections work. A big thank-you to her as well. Jeremy Fry was instrumental in putting everything together with his Hampton River Runners. It was a great night at a super facility with over 125 runners who enjoyed the evening. Thanks Jeremy, we couldn’t have pulled it off without you. Again, thanks to Sylvio, we will be travelling to Tracadie for our 8th celebration in our northern community on Nov 19, 2016. • Our finances are in good shape, with an annual budget of around $30,000. • We gave out four Education Awards (total $1,000) to runners in grade 12 or going to college or university. In addition the Chaleur Running Club contributed $250 toward a fifth education award. • Our three-year agreement with the New Brunswick Medical Society as sponsor of our young runners is over. We hope to renew our contract with them in 2016. In 2015 alone, we awarded young runners through this program over 3100 medals. It’s been a win-win situation with the Medical Society over the last three years. We can’t do it without them. • A Race Directors’ meeting in Fredericton was well attended with over 30 taking part in the day-long event. • 24 provincial records were broken this year compared to 18 last year. See our new web page coming soon. • In 2016 we will again be publishing a booklet of our running calendar. We expect it will be ready for the Lorneville Loop in early April. • With Gilles Gautreau and Darrell Travis inducted, our Hall of Fame is now set at 16. • Our first year in a three-year agreement with ANB to have Gabriel LeBlanc act as our Executive Director was a resounding success. 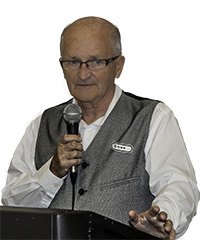 • Paul Lavoie who has been our treasurer for over 20 years has stepped down. Many thanks to Paul for his years of contribution to our sport! • Marcie Holland from Saint John, a Chartered General Accountant is our new Treasurer. • You will probably see some changes to our web pages over the upcoming months. • Rob Jackson was elected President after I decided not to re-offer. - Shelley Doucet's 10-mile record is a provincial overall record. - Frank Kelly set a Canadian 5-mile record for M75-79 in Hampton with a time of 40:39. This year saw the 40th edition of this event. On race day there is a 3K, 8K walk and run and 21.1K. The half marathon is the super series race. This race is very well organized, the 40 years of experience really shows. The course is fair and challenging and the volunteers are encouraging and hard working. The organizers also provide the most awesome chicken dinner at the awards ceremony after the race! We wish to thank Gaétane Duval and her team for 40 years of dedication in promoting road racing in NB and congratulations in winning the 2015 Event of the Year. Rob has had an incredible racing season. He won a Bronze medal at the World Masters Championships in Lyon France with a time of 1:21:33 in the half marathon. He set a new Canadian 5 mile age group record of 28:52 at Hampton. In total, Rob set 14 road and track records in the 60-69 age category, including the 1 mile, 5K, 8K, 10K, 15K and half marathon. Nearly all of his records are age graded above 90%, which is considered world class! Rob was recently recognized for his outstanding running accomplishments when he was named Canadian Masters Athlete of the Month for September. Rob running the 2015 YSJ 10K at the Saint John Airport Rob running in the 2015 Hampton 5 Miler Sylvio Bourque (L) Vice-Chairperson of RunNB presents Robert Jackson, 2015 Male Runner of the Year award. Shelley has the fastest female time in all of the five major road race distances from 5K to the marathon in 2015, plus the fastest 13K, 15K and 10 mile in NB. She won the Run for cycle by over six minutes and broke a provincial or course record in every race she did with the exception of one race. The highlight of her season was running a 2:50 marathon at Sugarloaf, Maine and in the process, winning the female title by 20 minutes. This was a Provincial record and the fastest marathon time in Atlantic Canada. RunNB is proud to name Shelley Doucet as Female Runner of the Year for 2015. Marcie Holland began running only two years ago and has already hit NB gold standard times for all the major distances. She has reduced her 5K time from 27 minutes to 20 minutes and her half marathon time from 1:52 to 1:33. Her progress at the marathon distance is even more impressive. In her first marathon, which was at Moncton in 2014, Marcie qualified for Boston. In her second marathon, which was in PEI this October, she bettered her Moncton time by 17 minutes and was the overall female winner with a time of 3:16. RunNB is pleased to recognize Marcie as the Up and Coming Female Runner of the Year for 2015. Michael has had a very successful running season. At the Irish Festival in July he won the 5K in a time of 15:37 which is the second fastest time in New Brunswick this year. He also won the 5K races at the Fredericton Marathon and Dam Run. Michael was the 2015 winner of the NBIAA Cross Country Championships for Senior HS Boys. He was also the fifth ranked male in New Brunswick at the 10K distance. He won the Fall Classic 10K in a gold standard time of 33:18 and was the winner of the Run the River 10K in November. Frank enjoyed another awesome running season. He competed in 13 Super Series races coming first in his age group in all but one of them. He also completed the ‘Run for Cycle’ in a time of 8:21:13. He again ran the Boston Marathon and has qualified again for next year. In October this year Frank ran in the Maine Half Marathon, in Portland, finishing first in the M75-79 age group, in a time of 1:58:01. RunNB is pleased to recognize Frank's wonderful year of running with the Personal Achievement Award for 2015. Frank Kelly running Marathon By The Sea in Saint John, NB. (Photo by Al Gagnon) Frank Kelly running YSJ 10K in Saint John, NB (Photo by Gilles Gautreau). Frank Kelly with daughter, Marta Kelly at RunNB Awards Banquet (Photo by Gilles Gautreau). In 2010, Michel suffered a heart attack. In 2012, after a long convalescence, he started running again. He gradually increased his running and this year competed in 19 races. He also ran his first marathon at Legs for Literacy, finishing in a Boston Marathon Qualifying Time of 3:25:19! Michel has also raised a large amount of money for the Heart & Stroke Foundation and always makes himself available to other runners who are struggling with heart issues. Hearing his story gives them much positive energy to help in their own recovery and gives them the hope that they too will, in time, be able to run again. Michel, you are an inspiration to many. RunNB is proud to recognize Michel Roy as Inspirational Person of the Year for his courage and determination at overcoming adversity. Micho running the 15Km de Grande-Digue in April 2015. (Photo by: Olivier Goguen) Micho running the Demi-marathon de l'Acadie in July 2015. Cathy, our walker of the year in 2014 is a very fast walker. She started off the season by winning the Lorneville Loop 13K walk in a new record time of 1:37:44. Cathy completed the Port City Challenge at Marathon by the Sea. Then, in October, she won the Sweet Caroline 10K walk in a time of 1:03:39. Cathy is so fast that she has time to take awesome photographs at many of the events! Congratulations, Cathy, on another speedy walking season. RunNB is proud to recognize your dedication and achievements with this Walker of the Year Award for 2015. Cathy Smith walking the YSJ 5K in Saint John, NB (Photo by Gilles Gautreau). Cathy Smith walking the Hampton Five Miler. [Photo by: Gilles Gautreau] Shelly Doucet (L) presents Cathy Smith with the Walker of the Year award. Education Award - Each year RunNB awards $250 to four runners who take part in our races through the year. The runners must be in grade 12 or going to college or university. Elites Series: The Elite Series was implemented in 2014 to promote a series of races that would award prize money to the top three NB male and female runners. The minimum prize structure of the race series is as follows: 1st $80 / 2nd $60 / 3rd $40. Each race puts up a total of $360 in prize money to be part of the Elite Series, for the top NB male and female runners. Some races give higher cash prizes and may also award prize money to more than just the top three male and female runners. Run For The Cycle - Dean Strowbridge and Shelley Doucet are the champions of Run For The Cycle for 2015! Dean completed the 5k, 8k, 10k, half marathon and full marathon in a combined time of 5:30:48, nearly ten minutes ahead of his nearest rival, Remi Guitard, who clocked 5:40:04. Jeff Queen finished third in 5:43:24. Shelley Doucet won the women’s Cycle with a time of 5:37:41, six minutes in front of Paula Keating’s 5:43:49. Brenda Guitard was third in 6:24:22. Congratulations to all who accomplished the very tough goal of completing the Run For The Cycle! Much has been said about Gilles Gautreau over the years. It would be impossible to capture all of his accomplishments and contributions to running in a brief presentation. As many of us know, one expression is often used to describe what Gilles means to running in New Brunswick: “The Godfather”. Gilles est le parrain de la course sur route au Nouveau-Brunswick. Je vous assure que sans son dévouement et son désir de terminer tout ce qu’il entreprend, nous ne serions pas ici ce soir, parce que Course NB n’existerait pas sans lui. Tel un phénix, Gilles a fait renaitre Course NB de ses cendres il y a plusieurs années et, depuis, il continue de travailler sans relâche pour Course NB, sans attendre ni remerciement ni faveur. Gilles was nicknamed by some of his running friends as The Godfather of road racing in NB. I can assure you that without the dedication and never-say-die attitude of Gilles, we would not be here tonight, because RunNB would not exist. Gilles pulled RunNB like a phoenix from the ashes many years ago and he continues to work long, long hours for RunNB to this day, with no thought of thanks or favours in return. Gilles started running in August of 1983 as a way to stop smoking. He ran his first NB road races in 1984. He ran cross-country and track and field for UdeM from 1984 to 1989 and was the top male cross-country runner at UdeM for every one of those five years. Gilles competed in several national championships in road racing, cross-country and track, notching PB’s of 31:23 for 10k and 1:11:10 for the half marathon. He is listed seven times in the RunNB Records and holds NB track records for M40-45 at 10000m in 32:52 as well as M45-49 5000m in 16:36. Gilles has coached several of NB’s elite runners, including one of our finest, Barry Britt. Pendant 26 ans, Gilles a fait le circuit des courses, et son travail au nom des coureurs est tout aussi impressionnant. Gilles siège au Conseil Administratif de Course NB depuis 2000 et a été président de Course NB de 2008 à 2013. Il a démarré le site Web de Course NB en 2000. Il est un photographe accompli et en a immortalisé plus d’un parmi nous, dans nos moments les meilleurs comme dans nos moments les plus difficiles. For 26 years Gilles burned up the racing circuit. But his work on behalf of runners is just as impressive. Gilles has been on the RunNB Board since 2000 and was President of RunNB from 2008-2013. He got the RunNB website started in 2000. He is an accomplished photographer and has used those skills to create lasting records of hundreds and hundreds of us in our best and our toughest times. I’m proud to have been at the starting line in many races with Gilles. I’m proud to call him a colleague and a friend. And I’m proud to sing his praise. Father, husband, runner, cyclist, photographer and, oh yes, godfather. Ladies and gentlemen, inducted to the RunNB Hall of Fame 2015, Gilles Gautreau. RunNB Chairperson, Brian Richard presents Gilles Gautreau with the RunNB Hall of Fame plaque. Gilles becomes the 15th member of our honoured Hall of Fame. Darrell Travis is an icon of the road racing community in southwestern New Brunswick. Darrell was a familiar face on the start lines of many of the province's leading road races over three decades, consistently placing near the top, weekend in and weekend out. However it is his organizational work and leadership, coaching and the encouragement that he provided the regional running community that has provided the greatest contribution to our sport. Darrell was a past member of the organizing committee of Marathon-by-the-Sea and one of the founders of the Hampton River Runners, and its flagship event - the Hampton Five Miler. Legions of recreational and competitive runners have risen in his community and the broader region as a result of “Hampton five mile fever” that emerges each summer on the roads of Hampton. In many people's eyes, Darrell is viewed as the catalyst that created a culture of running throughout the region. It is not a stretch to suggest the emergence of national caliber runners such as New Brunswick record holders Grace Annear and Barry Britt, along with strong university runners like Gerald Demers and Adam Keller were all fostered, at least in part, by the running culture within their home town promoted by the club and its leading member - Darrell Travis. Darrell’s 19 consecutive Boston’s is an iconic testament to the inner perseverance that every successful runner has within their soul. His treks to Boston inspired many a person from our region to train and qualify for the “great race”. 19 - yes nineteen (19) consecutive runs is a remarkable accomplishment, recovering from a major surgery weeks before one of the races is – super human. I doubt any one can properly tally it up – but we would suggest that his immediate running fraternity of friends combined have completed over 200 Boston Marathons – lining up in the iconic little town of Hopkinton and finishing in the great city of Boston – all of them first inspired by Darrell Travis. 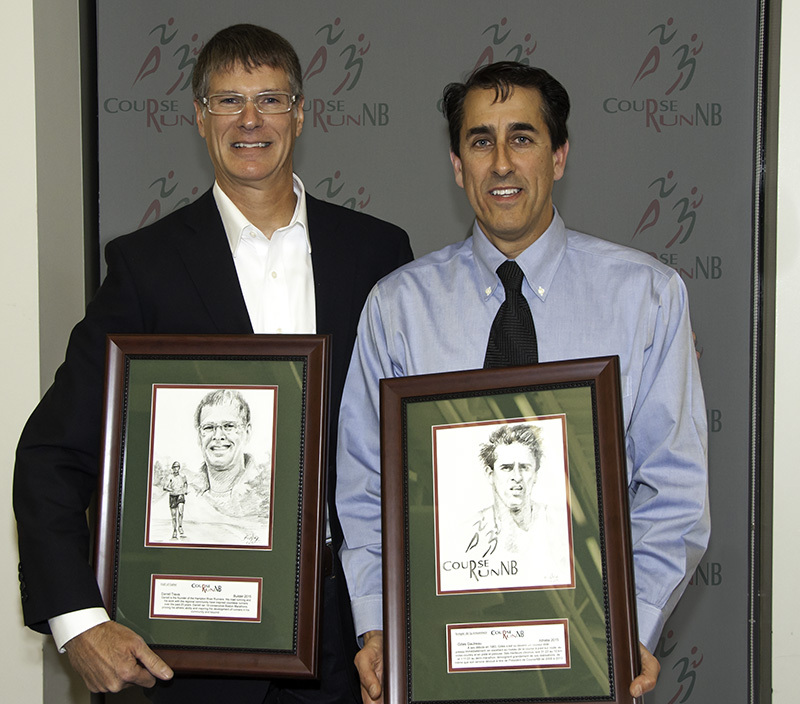 RunNB is pleased to welcome Darrell as the 16th member to our honoured Hall of Fame. RunNB Chairperson, Brian Richard presents Darrell Travis with the RunNB Hall of Fame plaque. Darrell becomes the 16th member of our honoured Hall of Fame.